Yesterday I finally got the news I’ve been waiting to hear since August: your visa is ready. Though it’s not my visa, it’s been my project these past nearly six months and I’m ready for it to be over. However, as with any bureaucratic task there’s one last obstacle: getting to the Consulate in Houston. Now that I’m in South Texas, most things are far away. But a map showed me I am actually closer than I thought. I live off of US Highway 59 and it isn’t much to write home about. But it will get me to Houston in one straight shot and in only 4 hours. Houston was about 3 hours from Austin, which is coincidentally how far I am now from Austin. Yet Houston is only one extra hour away. This may not be a big deal to most people, but when you’re from Florida everything just gets farther away. Given that my home state has a mostly vertical orientation, driving anywhere interesting (i.e. along the coast) takes a while. Moving from Ft. Lauderdale to West Palm Beach only makes Miami farther away. 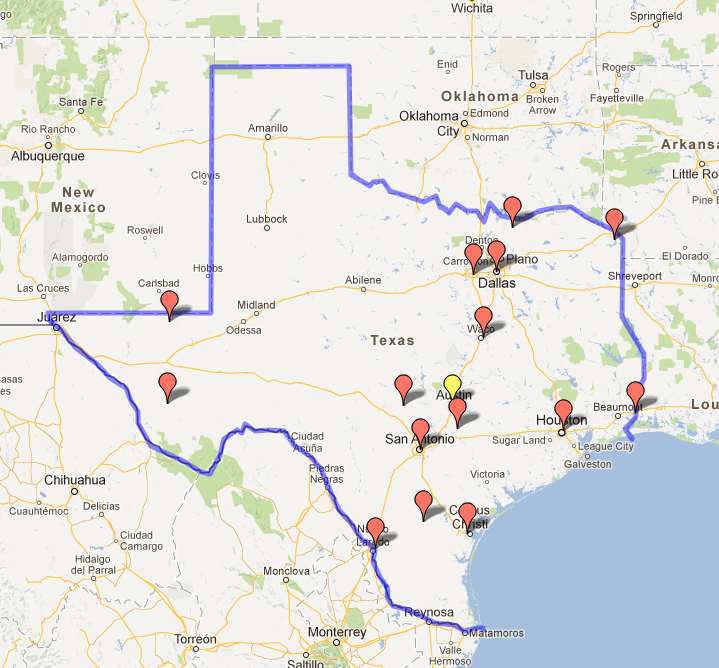 I’m also excited about taking this stretch of highway, which marks an unexplored area of Texas. 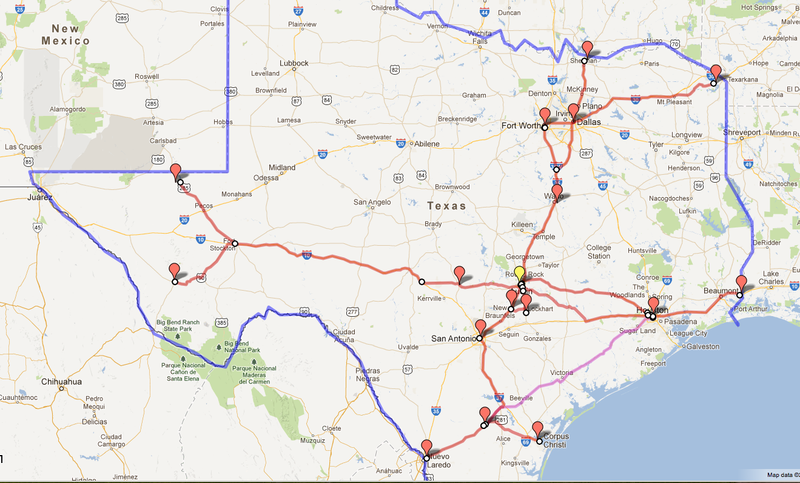 After playing with Google Maps I’ve come up with these maps of my travels through the Lone Star State; the pinkish line is my upcoming trip. When I came here for graduate school in 2008 I didn’t anticipate so much crisscrossing, or border-skimming. I wish I could’ve gone to the lonely NW top hat but perhaps in another life. I can’t touch Chet Garner but I’ve hit lots of real interesting points in the state.